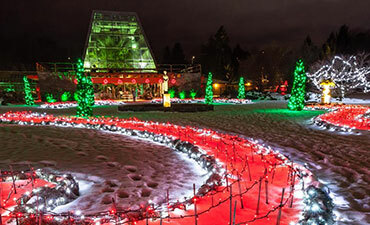 The Niagara Parks Floral Showhouse building and surrounding grounds are brilliantly decorated with lights during the Festival. Visitors are free to park at the Floral Showhouse during the evening and walk around the exterior to enjoy the light displays. Entry into the Floral Showhouse to see the floral displays during the daytime is by admission only ($5.00 for Adults | $3.75 for Children 12 and Under | 5 and Under are Free). Just outside Dufferin Islands, visitors can observe the world’s largest illuminated Canadian-American Flag. At three stories in height, this display morphs between the Canadian and American flags. This flag display was added to the Festival in celebration of 200 years of uninterrupted peace between our two great nations. Our signature Noah’s Ark display can be found along the Niagara Parkway near Dufferin Islands. Look to the river-side of the parkway to see it!